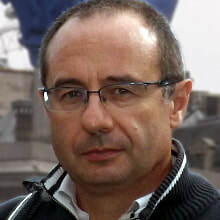 Carlo Gaetan obtained DEA in 'Statistique et Modèles aléatoires en Économie et Finance' from the University of Paris VII in 1992 and his PhD in Statistics from the University of Padua in 1994. He was Researcher at the Department of Statistical Sciences, University of Padua and Researcher at the Department of Statistics, University Ca' Foscari of Venice. From Mars 2005 until to December 2010 he has been associate professor in Statistics at the Department of Statistics, Ca' Foscari University of Venice. In January 2011 he joined the Department of Environmental Science, Informatics and Statistics (DAIS). From December 2017 is full professor in Statistics. Since 2017, he has served as associate editor for the Journal of the Royal Statistical Society Series C "Applied Statistics". His principal areas of research are spatial statistics, extreme values and environmental statistics.